The official state bird of California is the California quail, a fine representative for the state. The California quail was chosen, in the late 1920s, by a state-wide, albeit, unofficial vote. Among the top candidates for state bird was the California condor. Here’s the story. The California Audubon Society is sponsoring a move to secure a poll of the state as to the choice of a state bird. 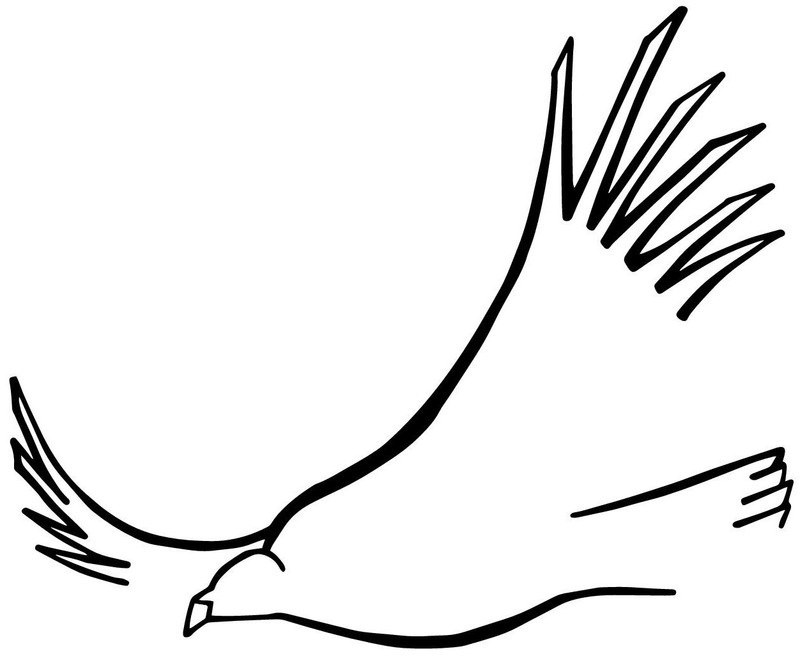 Children in the schools will enjoy making recommendations as will many bird lovers. The great California condor, the largest of land birds in North America, is restricted to this state and might well be chosen because of its size and its historical background. In making a choice of a bird typical of the Golden State we should avoid the possibility of some time finding that bird threatened with extermination. Californians long ago destroyed the last of the magnificent grizzly bears which were once sufficiently typical of our mountains and plains to be chosen as the emblem for our State flag…. The official bird should be one that is at all times protected by State laws; one that breeds in California…; one that is loved throughout the State by the public. 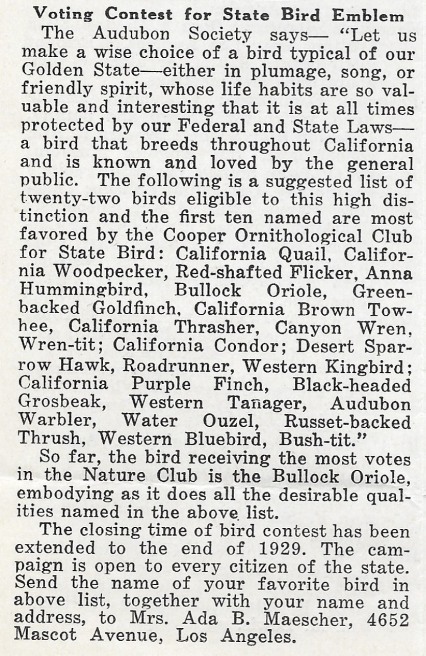 The project to choose a state bird was announced in the Los Angeles Times of 6 May 1928. The article “State bird to be named” listed the California condor among a number of candidates. Before anyone can vote intelligently for his choice it will be necessary for him to know something of the bird life of California. The study of birds for this purpose by a larger proportion of our people and especially of our children will result in an increased interest in the conservation of wild life. Recognizing the possibilities of this campaign many organizations are asking how they can participate and co-operate. This campaign is open to all organizations and individual votes are to be polled. Every vote will be counted. The bird receiving the largest number of votes at the close of the state-wide contest will be presented to the legislature with the request that it be officially adopted as our State Bird. The campaign to choose a state bird was also announced in the June 1929 of the Bulletin of the Nature Club of Southern California, a copy of which I recently acquired. So how did the California condor do in the polling? According to “Record of Votes for California’s State Bird” in the March 1930 issue of the Gull, the condor placed 8th with 2,522 votes. The California Quail was the overwhelming favorite with 61,559 votes out of the 135, 299 votes cast. For more on the history of choosing California’s state bird, see the previous post: Yet another early-20th-century poem. The condor has gone on to represent California on the state’s quarter-dollar coin, the subject of another previous post: Thank you, Governor Schwarzenegger.